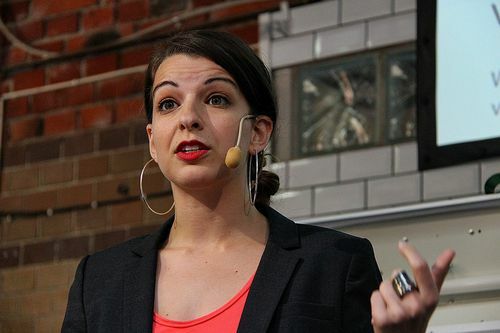 Anita Sarkeesian • Feminist speaker canceled Wednesday lecture over security concerns. (Courtesy of Susanne Nilsson) An email to Utah State University threatened "the deadliest school shooting in American history" if the school did not cancel a lecture by a well-known feminist writer and video game critic Anita Sarkeesian. Alex Lazara | Courtesy Feminist Frequency Anita Sarkeesian at The Rusty Quarters Retro Arcade & Museum in Minneapolis. 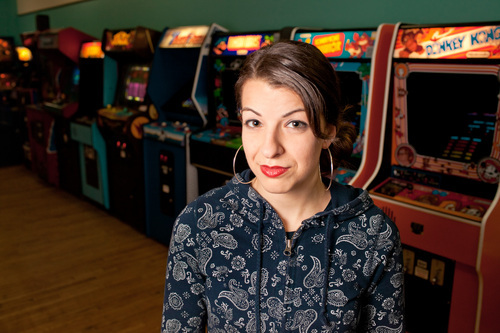 Sarkeesian canceled a speech scheduled for Wednesday at Utah State University. A multi-law enforcement agency task force, including the FBI, was hunting Wednesday for the author of an email threatening bloody mayhem at Utah State University if feminist writer Anita Sarkeesian spoke on campus. Sarkeesian, nationally known for her criticism of how women are portrayed in popular video games, blamed her decision to cancel her 11:30 a.m. Wednesday appearance at the Taggart Student Center Auditorium in Logan on both the threat and a state law that allows conceal-carry permit holders to be armed at events in public venues. USU spokesman Tim Vitale insisted that campus officers were well-prepared to protect her and those attending her address. "She was worried about Utah law preventing police from keeping people with legal, conceal-carry permits from entering the event," Vitale said. "But our police were prepared and had in place extra security measures. It was her decision to cancel." Nonetheless, USU police  working with FBI cyber-crime experts and other law enforcement computer specialists, such as the Statewide Information & Analysis Center (SIAC)  are taking the threat seriously. "There&apos;s no doubt: We are going to pursue this. The investigation is underway," Vitale said. "We have the best people in the business on this, tracing the email and IP [Internet Protocol] addresses, following that trail to the end." As is typical in ongoing investigations, the FBI declined to discuss the USU incident when contacted Wednesday. The email, purportedly from an anonymous USU student, promised "the deadliest school shooting in American history" if Sarkeesian&apos;s Center for Women and Gender Studies-sponsored talk were allowed to proceed. The writer claimed to "have at my disposal a semi-automatic rifle, multiple pistols, and a collection of pipe bombs" he intended to use to ensure Sarkeesian would "die screaming like the craven little whore that she is." Claiming the moniker of "Marc Lepine," the perpetrator of a 1989 mass-shooting at Montreal engineering school that claimed the lives of 14 women, the emailer also said he would target as many other "feminists on campus who won&apos;t be able to defend themselves. One way or another, I&apos;m going to make sure they die." Feminists have ruined by life," the emailer contended, adding that he intended to write a "manifesto in blood" to avenge himself, and the "emasculated cowards too afraid to challenge the vile, misandrist harpies who seek to destroy them." Vitale said USU had decided to go ahead with the event after consulting with local, state and federal law enforcement. Along with increased security measures and personnel, the school also planned to forbid backpacks in the auditorium. Tweeting on Tuesday night, Sarkeesian complained that USU had refused, however, to install metal detectors or to routinely do pat-down searches of those attending her lecture. "It&apos;s sort of mind-boggling to me that they couldn&apos;t take efforts to make sure there were no guns in an auditorium that was threatened with guns and a mass shooting," Sarkeesian told The Associated Press. "I don&apos;t understand how they could be so cut and dry about it." Sarkeesian says she has received many death threats in the past, including a bomb threat last Saturday. However, she went ahead and spoke at that event, the Geek Girl Con in Seattle.